My thanks to all of you who linked up your fabulous finds at last week's Vintage Bliss Tuesdays Linky Party. I was thrilled that so many joined in for my very first linky party. And what a wonderful and eclectic mix of goodies. I enjoyed visiting each and every participant. If you missed it, be sure to check out the goods now. I was also happy to see party guests visiting and commenting on each other's posts. It's what a party host hopes for, right? Mingling and talking. This week I'm sharing more of the thrifty finds I discovered while shopping with my sister recently. While I definitely don't suffer from a lack of dishes, on that particular shopping day I decided to focus on finding smallish, round plates for my food photographs. Small and round makes for the easiest food photography I find. But I have been using the same small white plate and bowl a lot recently. So I went hunting for a variety of plates. This Eiffel Tower plate is my favourite. Only it isn't the easiest to use for food photos, because you have to kind of position the food around the picture so you can still make out what it is. But it's fun. I've already featured it on Instagram. 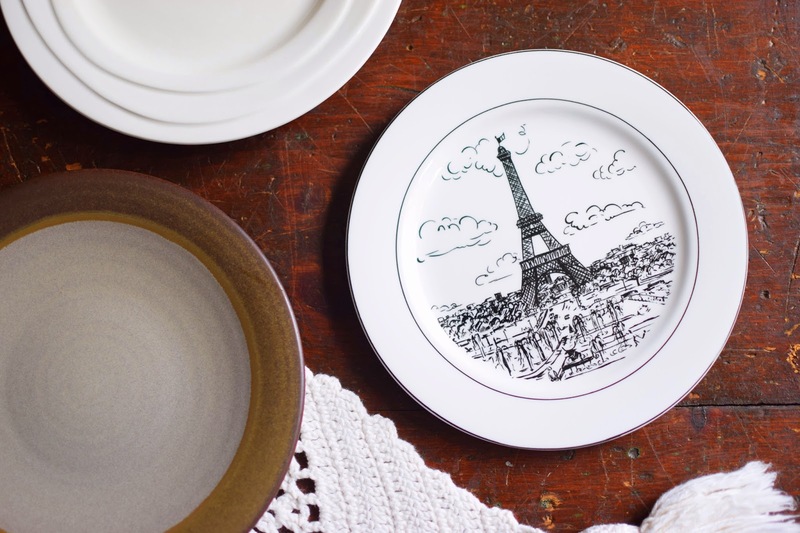 It's a Mikasa Ultima Plus Parisian Scenes design by Susan Steinberg. It set me back $2. The white plate above it is a Jamie Oliver. I like that it is a simple white, but has curvy lines around the rim for texture. The two-tone brown plate is another Mikasa - Potter's Art in Swiss Coffee. This white bowl simply says "China" on the bottom. It could be from the dollar store for all I know, but I like it because its low profile makes it good for showing off soup or stew. The pretty blue plate is Gibson Everyday. The patterned plate on the lower left is Creative fine china, made in Japan. I also dug through the cutlery at Goodwill. I wanted a few extra forks and spoons to use for food photos. They had $1 stickers on a few of them, which seems a bit ridiculous. The rest weren't priced, so I didn't take too many to the cash. Then I found out they were only 10 cents each. At that point we had been shopping for so long I didn't feel like going back to get more. Hunger is my shopping enemy. I bought the lovely crochet table runner at a thrift shop a couple of years ago. I think it's the perfect table accent for fall and winter. Speaking of the table, I got this well-used beauty from my daddy. The table top was lying on its edge in my parents' basement. My husband took it home and put legs on it and set it up in the basement by a big window for me. Dad got the table top at his former workplace, where it had been used by the on-staff tailor. It's all beaten up and cut and I just love using it, especially knowing that it has a long history of serving others. I have created a handy button should you want to encourage others to join our party. Or you can use a text link instead. Please follow Woman in Real Life on Bloglovin' to be reminded when it's party time. And invite your friends. The more the merrier. Cheers! whoops my comment disappeared I think. 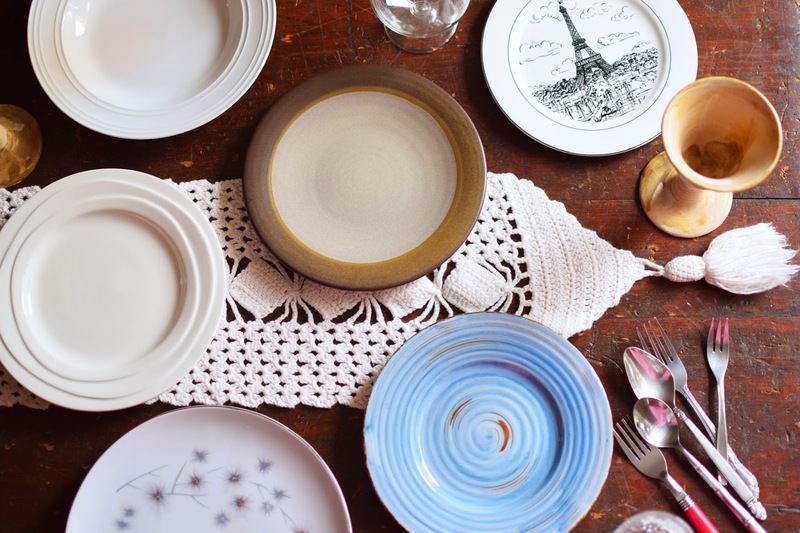 I love those plates (especially the Paris one)! I'd like to join your party but for lwhoops my comment disappeared I think. 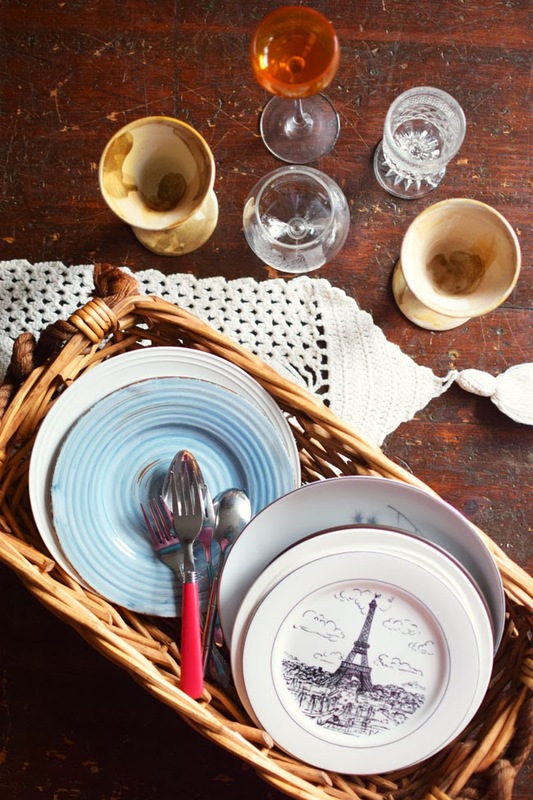 I love those plates (especially the Paris one)! I'd like to join your party but for last week I forgot to photograph some of my favourite things before storing them away!ast week I forgot to photograph some of my favourite things before storing them away! The first thing I noticed was the table top....how beautiful! I'm linked! Hugs! I very rarely ever look at plates, I think you have an eye for pretty ones, I always notice them on your pics! Thanks for hosting this great new party, Joann - here's to another great week! So true, I like the old things with memories attached to them. I like the way you have displayed the plates in a basket. I have been on a a platter tear recently. I may have to steal the basket idea to display them - no wall space left to hang them. Thanks for hosting! The basket really came out of necessity. I have run out of room to store dishes. ;) And this way I can carry them around while I'm taking food photos. Thanks so much for linking up. Lovely display! Oh I love me some dishes too, lol. Fun to hunt for everywhere. Would love a look at the whole table sometime. Thanks Pam. Glad to hear you're dishes-obsessed too. ;) I'll definitely show the whole table some time. Congrats on the blog anniversary! Just discovered your new party -- what fun! 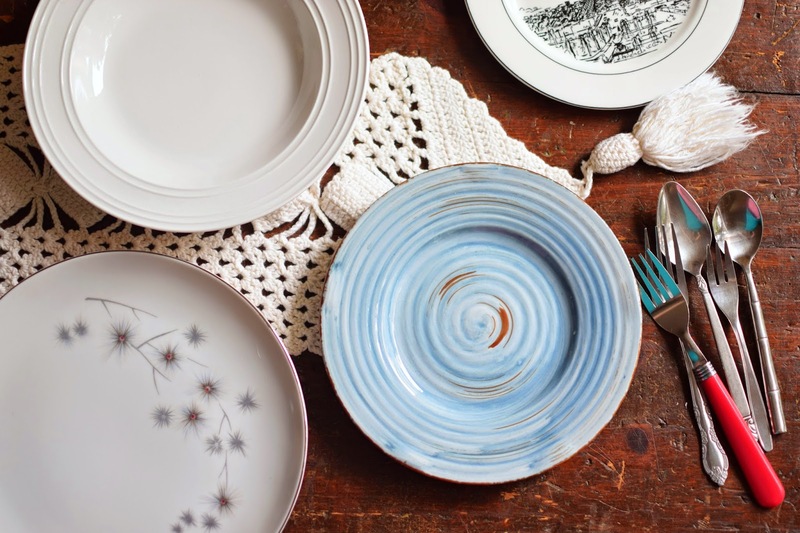 Love your plates -- especially that cute blue one! I like your plates! Thanks for this new party. Thank you for linking up all your wonderful finds! I really like your Jamie Oliver plate - I've found his stuff at discount stores and its always the perfect combination of formal and informal. Thank you for hosting Vintage Bliss Tuesdays Linky Party Joann.